Anyone who is into cold climates, freezing and the like knows that fats are of absolute importance. If you suffer from a too high fat percentage I can advice a lot of underdressed activities at any time of the year, within safe boundaries of course. During the summer you can get away with a diet quite high on carbohydrates, with just a little protein and fat. However at this time the latter becomes increasingly important. If I eat too much carbs, especially sugary fruits, I freeze a lot easier than on fatty meat. 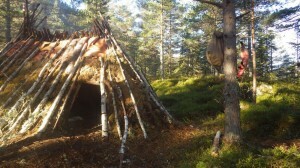 In my area, the primary source of fat for the winter, the bear is no longer available unfortunately, but there are still solutions about. All animals contain a bit of fat, but not always enough for you to survive on. From what I have read a maximum of 70% of the daily calorie intake can consist of protein, so the rest have to be covered by carbohydrates and fats. I definitely seem to do better on a 55% protein, 40% fats and 5% carbohydrates. Rather preferably more fat than this! 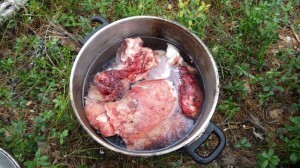 After the blood, liver and the other organs of deer kind animals have been consumed, next in line is marrow and brains. All of this is eaten a bit mixed up, with meat as well of course. The point is to eat the things that spoil first. Last the meat is cut up to dry and the fat around the intestines and under the skin as well as in the crushed bones is rendered for storage. In winter this is less of a consideration since the meat can be kept frozen. Lean meat I do not like. I’d rather feed the tenderloin to a dog than to eat it. There are virtually no tendons in it either to help your digestion. Good stuff: The ribs are excellent and there is a big lump of fat behind each eye. Fish mainly have fat in their head, the roe and around the intestines. Some species have a lot of oil in their liver. If the fish is lean and you’re short on fat, better to dry or discard the meat itself in favour of these other goodies. Caught a badger, boiled the whole animal (no skin or guts of course). I bet it must have had 50% fat, I got pretty disgusted by the meal… I have found that I tolerate rendered fat with dried meat or fish better than fresh meat with lots of fat on. Next time I get hold of such an incredibly fatty animal I’ll make sure to cut off as much of the fat as possible and then roast it. Badger tastes almost like pork by the way! 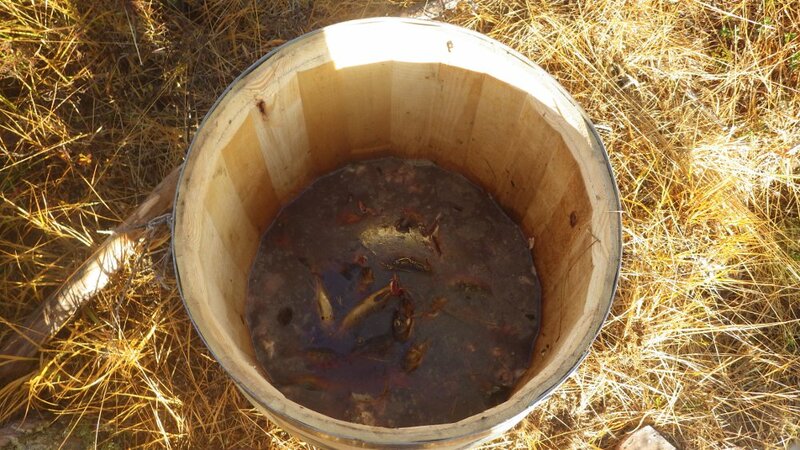 As a new experiment all the fish heads, guts and fish found to be of too low quality were thrown in a barrel with water to rot. They’ve now been fermenting for about 5 weeks and I’ll give the goo another couple of weeks before I attempt on boiling the oil out of it. If it works it’s an excellent way of putting discarded fish matter to use. Brum was also so kind to give me a jar of excellent wild boar fat. I was living well off that for a while! 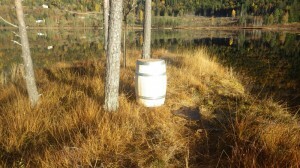 This summer I made a new willow fish trap. It’s woven from shoots, with the funnel as a seperate part. There is no hatch to remove the fish, but the funnel is tied off and the trap emptied from the front. 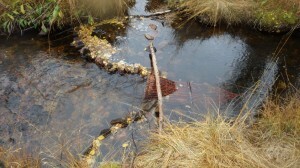 The weir is constructed in a bit of a wedge shape from rather small stones. If the current is heavier you’ll need bigger stones. 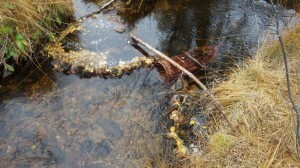 Even if the weir overflows a bit or seeps through, it doesn’t affect it’s use much. Any fish sized holes has to be closed though, and it’s particularily important to close well with stones around the trap itself. Took around 500 trout in this trap during the spawn run. Capacity record for one night was 66. That was achieved through walking in from below to scare extra fish into the trap and lifting it onto land before they were able to return. To increase the capacity further the chamber in the back would have to be enlargened. Some of the smaller fish were also slipping in between the willow as it got softer with moisture. To remedy this problem I could have twined more closely. Summer footwear has been a thorn in my side for quite some time. The climate I live in is quite wet (lots of bogs and streams) and I’ve been experimenting with various ways of keeping my feet warm enough and protected even through this. Avoidance. This is what most modern people do. When it’s raining they stay in a shelter most of the time. Also completely practical in a drier climate when you’re living off the land, but here you’d practically never be able to get out and do the necessary hunting and fishing. Waterproof shoes. Definitely the most desirable option, but requires a lot of skill and time to make. In the rocky terrain here and since I walk a lot, I can’t see it paying off most of the time. No shoes. Works if it’s not very cold, very rocky or damp for very long times. However skin softens with dampness and you’re far more likely to cut yourself if walk around barefoot for extended times, especially carrying heavy loads. Wet shoes. Instead of avoiding wetness you embrace it. It has become my choice for summer footwear. Since I’ve landed on using wet shoes, I’d like to expand more on that option. The shoes are known in recent times from at least Iceland, Scotland and Ireland, but Norway’s oldest shoe is of the same style and the oldest leather shoe in the world (from the Caucasians) is also made similarily. In Ireland they are commonly called pampooties and they are made out of rawhide. The stitching is crude and is usually also done with rawhide. 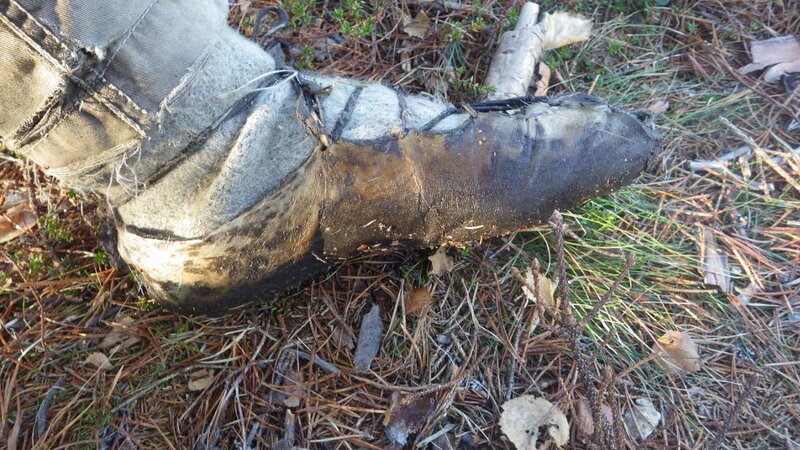 It’s better to have a bit loose stitches, so that the shoe doesn’t become like a bucket when it gets wet. Very quick to make. Requires no tanning and only very limited tailoring and sewing skills. Wears out a lot more slowly than buckskin in wet conditions, especially on rocks. Silent. Well fitted, these shoes are as silent as any buckskin moccasins. You have a very good feel of the ground. They require little to no maintainance. They are cold. 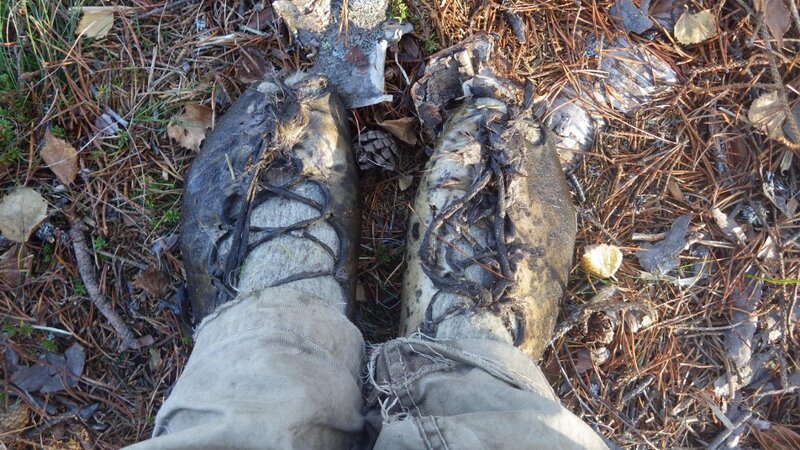 During colder weather (like wet snow) your feet will quickly become numb. After some time getting used to it, your feet will become less cold. If you wear thick woolen socks inside that will help a lot as well, but the shoes must be specifically fitted for that. In phases of autumn or spring when the temperatures vary a lot from day to day (from +10C to -10C) you have to sleep with the shoes under your matrass or you will not get into them in the morning. Always carry dry weather winter shoes during this time in case the weather stabilizes cold. When the ground is frozen solid, you will not get wet anyway. Slippery. 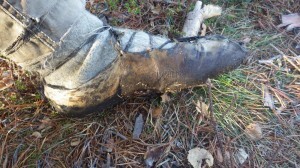 The shoes are at least as slippery as buckskin moccasins, especially after the hairs are worn off underneath. The good grip you get on the ground with your toes, somewhat helps to alleviate this. They can dry out. An advantage if you’re going to preserve them through a phase not using them (otherwise they’ll rot), but during very hot and dry summer days they can dry out during use and thus shrink and stiffen to the unbearable. Luckily, a quick dip in a lake or a stream will take care of it almost immidiately. The next article will be on how to make them according to the way I currently do. I’ve experimented quite a bit to find a way that is the most durable and functional. Two pictures of my former pair. 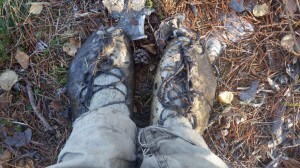 They were already very worn at this stage and were starting to tear at the front.